The Orlando Sentinel’s Ricardo Ramirez-Buxeda (who is a maker himself!) 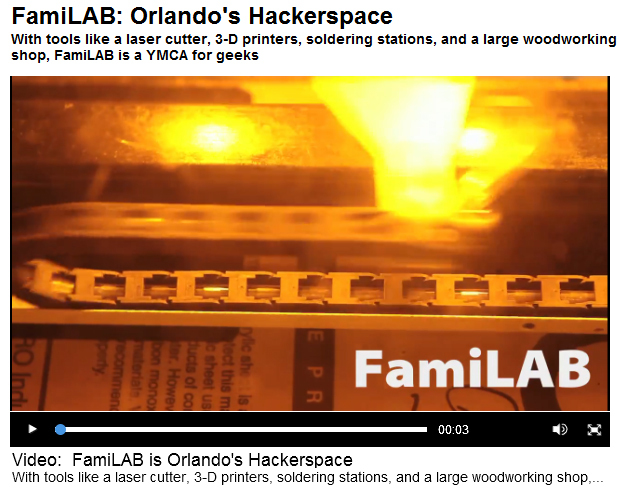 came out to FamiLAB to learn more about FamiLAB and Orlando Mini Maker Faire. He shot a bunch of video, and interviewed some of our Makers. Click the image below to see the video and read his story about FamiLAB. Ricardo also attended Orlando Mini Maker Faire – there are links to all of his event coverage in this Orlando Mini Maker Faire blog post. The place has really filled up.